Each and every state of the union has interesting and unique features. Find them in this United States Geography unit study. All the facts you need to know for your 5th grade-level report on any of the states in the USA. A brief overview of each state’s history, and additional pages with interesting stories. 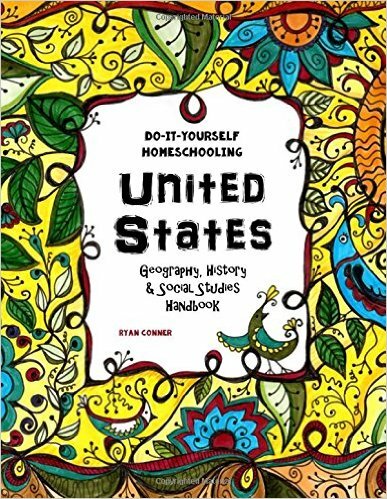 A Fun-Schooling Journal and Handbook for researching the United States of America. Make homeschooling fun with this library & internet-based learning handbook. This book covers the History, Geography, Social Studies, Culture, Travel, Population, Landmarks, Current Events and more. The student will be required to write, draw, read a variety of books and watch documentaries and movies as part of the course. This book is designed to be used by creative and independent students in 7th to 12th grades. Younger students can also use this handbook with extra help from parents, teachers and older siblings. When you need some hard numbers about things in the USA, who do you call? The US Census Bureau! Visualize and understand complex relationships between environments, places, and people. It contributes to your knowledge of the environmental, resource, demographic, economic, social, political, and historical dimensions of American life. Loads of miscellaneous facts, just in case you are entering the Geography Bee. Learn about the history and geography of each colony and then states of the United States of America with these fun unit study supplements. These include hands on activities, printables and online games to test your student’s knowledge. Get the fun started! John Potter provides a puzzle for the USA and every state in the Union. The Grunndargh, a group of aliens traveling through our Solar System, have disovered Earth — and they want to take over! They claim that humans don’t know enough about our own planet to run it well. Learn the locations, capitals, abbreviations and over 500 important facts about our 50 states. Makers of Place the State. A great assortment of games for each of our 50 states. Just click on the U.S, State that you want to study! Learn the capitals of the U.S. states by playing these Java games of Concentration, Matching, Word Search, or Flashcards. Got a bad case of wanderlust? Have an electronic postcard a day sent to you from a new site in America, if you can’t visit the website daily. Come with U-Haul on a pictorial adventure through North America that will stimulate your senses and challenge your mind. These images – and the stories they tell – have been created to bring you to new places and things. There are mysteries to solve, and wonders to be discovered. It’s now up to you. Nice graphic of all 50 states, each labeled with its capital. Do you know your State Flags? Quiz showing a state flag. You select a state and check to see if your answer is right. Interactive quizes to see how well you know your US geography. Use the tutorials first to learn the state facts, and then try the games to test your memory.